The storybook playhouse, with its mini golf course, is a grandchild magnet; Roz Milbrandt; a statue sits among the petunias in the children’s garden; planning for the Milbrandt garden began in 1996. The Rules at Grandma Roz Milbrandt’s place are: clothes will absolutely be worn to play in the water, dinosaur eggs exist if you hunt hard enough and fairies are ever-watchful. With six different themed gardens on 8 acres of land, Roz Milbrandt and her late husband, Micheal, created a fairy tale haven for their five grandchildren. Surrounded by flowers, water features, a storybook playhouse and even a mini golf course, this backyard paradise is a great example of garden planning for several generations of family. Grandchildren Alex, Katie and Micheal Heim, and Victoria and Gillian Brinton join us to share stories about Milbrandt Gardens, and what inspired its creation. Our tour begins along the gravel driveway, the stones crunching pleasantly beneath our feet. We pass beneath an arbor covered with climbing green vines and follow the cobbled walkway lined with blooms into the north garden. Unruly Russian sage is covered with tiny lavender flowers, and the bees flit from bud to bud. When we arrive at another arbor, shading two vibrant pink benches, Victoria, age 10 and Gillian, age 4, tell us these are their unicorn stables. These gardens were devised to let imaginations run wild, and these lucky kids are encouraged to make believe. There is plenty of work to be done too, Alex Heim, age 15, points out. As the eldest grandson, he gets to help with weeding and watering, jobs that keep him busy all summer long. Roz Milbrandt tells me that it takes five hours to mow the rolling country lawn. We continue along the curving cobblestone path and pass copper statues of the grandchildren. Iris blooms line the walk and peonies add a splash of color in early summer. A tiny wooden well near the barn beckons. Peek in to make a wish, and you will see your own face smiling back, reflected in a mirror on the bottom. Charming surprises abound in this garden built with little ones in mind. 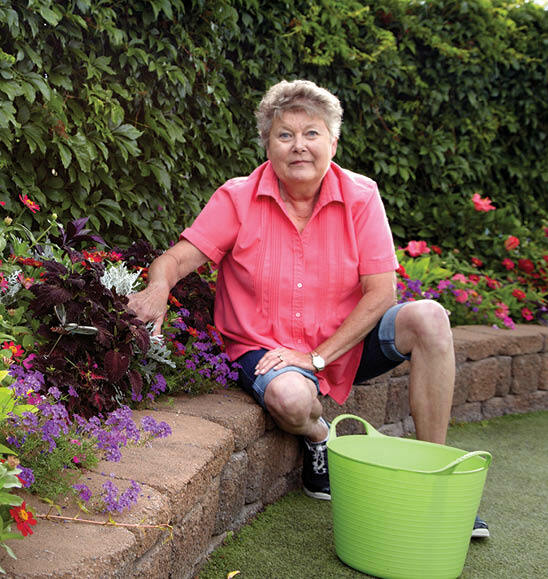 Roz Milbrandt grew up on a farm in Iowa, and remembers the family garden being very practical. “There were five kids, and you can’t feed ‘em flowers,” she says. Their two acre-sized gardens mostly held vegetables, and their fields were for grain and cattle. But Milbrandt has always been a gardener. Even when she had no land, she would plant pots on the deck. “Farming and gardening is in my blood,” she says. Her collection of gardens has a little of everything. In the potager garden, there are flowers, trees, concrete sculptures and vegetables. Potager is the French word for vegetable garden. The grandkids explain that this type of garden originated in the 13th century, when fences were added to keep out thieves. Their modern version has an electric fence to ward off forest thieves of another kind–deer and raccoons– for about six weeks every year. Their animal visitors are after the wide variety of produce in this garden, from peppers to sweet corn and basil. Her grandkids love helping when it’s time to harvest. There is plenty of lettuce for green salads, and tomatoes love to soak up the sun in this spot. In the fall, there are miniature sweet pumpkins for wonderful Thanksgiving pies. They collect apples to press into cider, too. Everyone pitches in to can, freeze, and eat as much as they can, and they give away everything else. We pass several bushes of Pinky Winky, a hydrangea relative tinged pale pink to white, and pass under another shaded arbor into the memorial garden. Though Roz Milbrandt’s husband, an avid fisherman, passed away in 1999, his spirit lives on in the form of a concrete boat and dock in the memorial garden. The grandkids eagerly clamor inside to play. Milbrandt says they’ve taken lots of imaginary trips all around the world, especially to England. “Peter Pan has been here many times,” she says with a wink. One of the trees in this garden is a pin oak, planted in memory of her grandmother, Edith Bell. “She planted her pin oak at her home when she was 70, against my father’s wishes. He kept telling her how slow they grow, and she said ‘Yep, I know’. She lived another 23 years and the tree was huge,” Milbrandt says. This pin oak gives gentle shade to the garden and serves as a reminder of a strong and independent woman. As we wind our way across the lawn the kids point out what they call “The Mysterious Beyond”, a name that refers to one of their favorite films, The Land Before Time. It is a wide expanse of marshland bordered by willow trees, perfect for climbing. The trees are a series of hideouts, beneath drooping curtains of branches. Elms and maples line the gravel path, and they will eventually grow to create a leafy canopy of shade leading down a gently sloping hill to the stream garden, built to connect two existing gardens—the memorial garden and the magic garden. The final plans came from a contest held at Hennepin Technical College. The winning design included a water element, but it was her grandson Micheal Heim, age 10, who suggested a special twist. He begged for a waterfall he could sit in. Steps were strategically placed in the stream so that you can wade in or sit down to enjoy the swish of water on a hot summer day. The creek bed is strewn with glittering marbles the girls call gems. “In the moonlight, they sparkle and guide the fairies,” says Victoria with delight. Little Gillian runs to ask her grandma if she can keep one she found, and smiles brightly when Grandma says yes. The magic garden was inspired by The Sword in the Stone, a favorite of Alex when he was 7 years old. 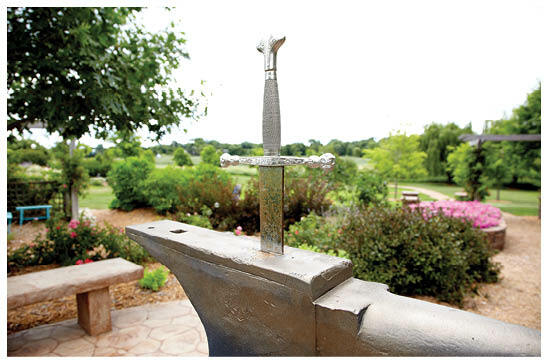 Milbrandt incorporated a real sword, large boulder, and an antique anvil found at an old blacksmith’s shop in Corcoran. It provides a striking centerpiece to the garden, ringed with roses and stone walls. “We make stories here,” Victoria says. The area also serves as a perfect setting for impromptu outdoor performances, with glass orbs glinting in the sunlight. The children’s garden is the last stop on the tour, and perhaps the most playful garden of all. The tale of The Three Billy Goats Gruff is referenced by a troll tunnel tucked under a miniature bridge. The oldest grandson has the job of playing the mean troll, to everyone’s delight. The crowning touch is a charming two- story playhouse with a mini golf course, climbable concrete mushrooms and a mailbox marked 10010 ½—almost a match with Grandma’s street address. The girls tell us they sometimes write letters to the Queen Mother, who writes back! We glance at Milbrandt, who gives a chuckle. Each year, the three huge, stone lined beds here are filled with an entire truckload (75–100 flats) of pink petunias. She also plants the things she’s grown from seed in her greenhouse. Victoria said she loves to plant the petunias and she’s learned what to weed and what to leave behind. 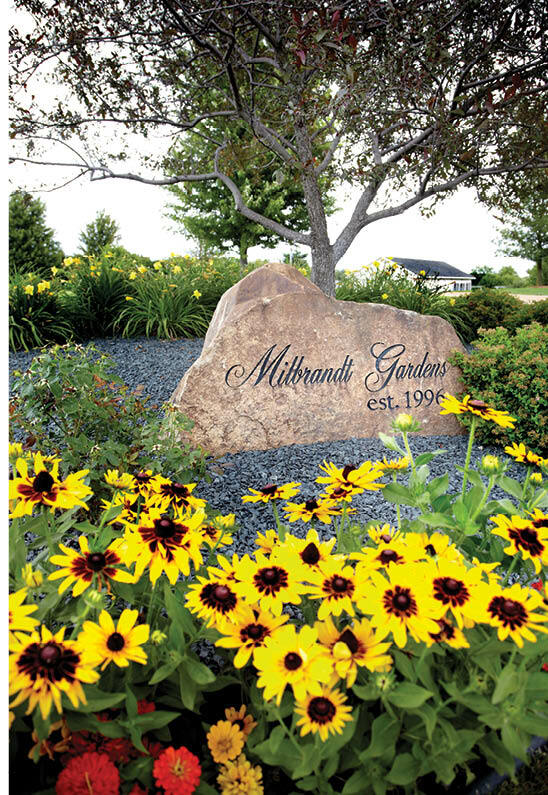 For Milbrandt, the gardens will never be complete. Each year she pours over seed catalogs and learns about the newest hybrids. She plans and adds meticulous notes on what worked one year and what should be changed for the next. 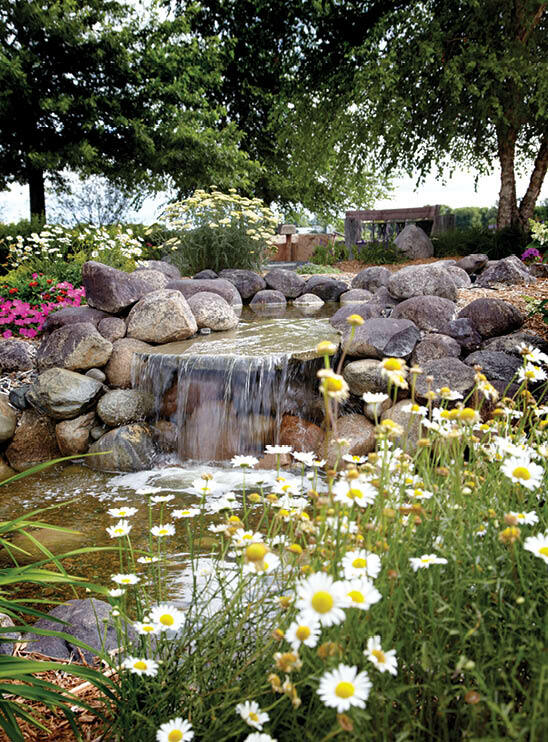 These beautiful, ever-changing gardens will certainly be a heartfelt legacy as the grandchildren grow up and begin to have children of their own. But at the moment, they are busy making their own memories in Grandma’s magical garden.